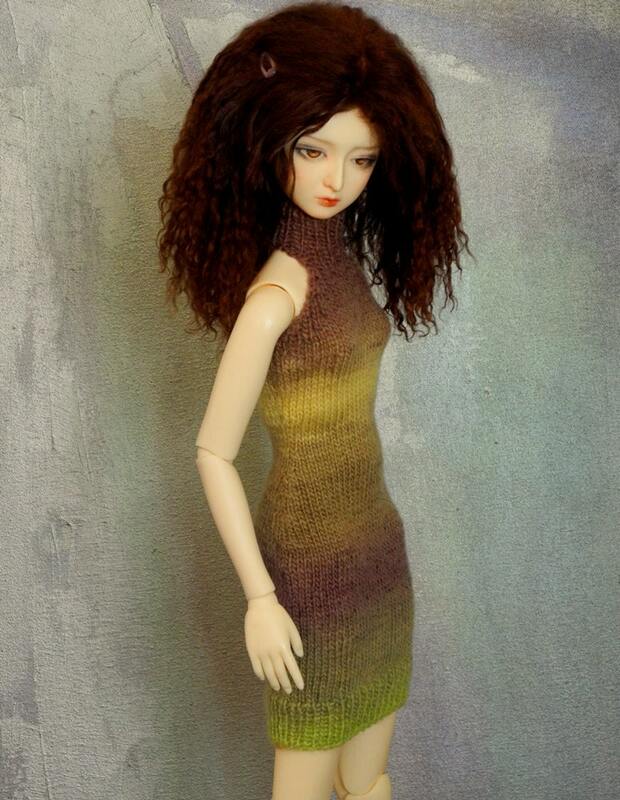 This body-conscious halter-neck dress is handknitted from a super-soft self-striping wool & nylon blend yarn from KnitPicks, in an unusual and subtle color palette of mauve, taupe, straw yellow, and poison green. Nightshade slips on, with two hook closures at the back neck and a hem that falls above the knee. I adapted this design from a pattern by Laura Gilkey in the old Den of Angels archives. Nightshade should fit most slender BJD girls in the 50-57cm size range, such as Customhouse/Aidolls, Luts Delf, Supia, Peak's Woods, Impldoll Model, and Dollstown 13; Zaoll and Shinydoll can wear it, too, though the fit will be less figure-hugging. My model (not for sale) is Kore Arabin, a 58cm Customhouse St. Mina on the original CH girl body. Beautiful sweater that fits well and looks wonderful on my doll! Thank you so much! High quality! Photos can't do this knitted dress justice. Absolutely love it! Hope you make more FID items in the future! Thank you! Method of payment accepted: Paypal, any method; credit cards through Etsy's Direct Checkout. Payment to be made in full within 24 hours of purchase, or sale will be cancelled. Full refund of purchase price in case of documented loss or damage during shipping. If you are unhappy with your sweater and would like to return it or exchange it for another item in my shop of equal value, please contact me within seven business days of the original sweater's arrival. I will gladly refund or exchange as soon as the original item is returned to me in new condition. US shipping will be by First Class mail with delivery confirmation. Insurance and Priority Mail shipping are available upon request, buyer to pay the exact cost. Shipping to other countries will be by First Class airmail (no tracking available). International shipping by EMS is available upon request, buyer to pay the exact cost. All packages will be shipped within 24 hours of cleared payment, except on weekends and US postal holidays. I'm sorry, but my work schedule doesn't leave me enough time for custom orders. If that ever changes, I will post an announcement here! About customs fees: International customers are responsible for all fees imposed, including import taxes, customs duties, and fees levied by the buyer's country. Additional charges for customs clearance must be borne by the recipient; I have no control over these charges and cannot predict what they may be. Customs policies vary widely from country to country; you should contact your local customs office for further information. When customs clearance procedures are required, it can cause delays of weeks or months. All international orders will have full value declared on customs forms - no exceptions. I do not refund original shipping charges for buyers who refuse items because of the customs charges applied by their country.